The Dixie Chicks are an American country band. They have had many hit songs. They are from Texas. 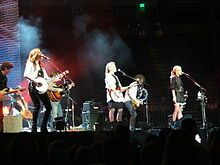 The Dixie Chicks are Martie Maguire, Natalie Maines and Emily Robison. The group formed in Dallas, Texas in 1989. They have won 13 Grammy Awards. When performing a concert in 2003 they garnered controversy afterward for Natalie Maines' comments about being ashamed that George W. Bush was from Texas. This page was last changed on 8 June 2018, at 02:15.